This write-up relates to the traditional Organizational Development methodology rather than the Emergent Organizational Development (EOD)® Platform generally referred to on this site. Organizational Development is a business strategy to achieve an organization’s Purpose and business goals through the enhancement of organizational, team and individual performance. Using ‘OD talk’, OD is the appreciation, development and integration of organizational dynamics, processes and elements (such as people, business processes, strategies, organizational design, systems (IT/IS), relevant environments, business models and culture (to name a few)), into a systemic, integral whole in order to achieve its ‘raison d’être’ – its Purpose, and its desired business goals. 5. Creating an ‘Emergent Living Culture’ that fluidly adapts to changing norms, beliefs, and values in its internal and external environments, as well as manifesting consistency and congruency between those evolving stated ‘values’ and day-to-day experiences. Simply, ‘culture’ is what people (internal and external) ‘experience’ as patterns on a continuous basis when interacting with an organization. OD focuses on developing the organization as an integrated, ‘whole system’ to create organizational capacity, viability and vitality. From a ‘whole systems perspective’ a change in one part may have a dramatic ripple effect on the whole organization. To appreciate such, one then has to ‘see’ the organization ‘as a whole, integrated, systemic system’ – which also includes its community, environments, supply partners, stakeholders and customers. Thus, OD takes a ‘whole system’ perspective in order to understand how the parts (both inside and outside the formal organization) work together to enhance systemic integration of its functions aligned to its mission, vision, values, and business goals. Traditional OD sees an organization’s mission, vision and values as acting as a foundation to its strategies, decisions and actions. I think we would all agree that each organization needs to develop their own unique mission, vision and value statements. Thus, I believe an OD approach needs to be fully customized within an overall OD approach because every organization is unique based on its own history, values, culture, issues, strategies, goals, performance levels, and where the organization is at in its stage of development as an organization. The OD ‘steps’ mentioned below allows for such customized OD designs to ‘fit’ that organization. The Fundamentals of Organizational Development (Emergent Action Research™). Open, integrated IT/IS/AI system designs, information streams, continuous loop feedback and pattern display interface. OD is like a ‘recipe’ with different designs and ingredients to achieve on-going development specific to THAT particular organization – with its own, unique history, culture, issues, strategies and goals. Fully customized approaches are called for to be effective – as well as creating the necessary degree of ‘readiness’, ‘ownership’, ‘effective engagement’ and a shift in ‘mental and emotional frameworks’ for effective change and development to take place. OD integrates concepts, tools and applications of behavioral science and applies relevant methods for the overall development of an organization. * IMPORTANT NOTE: Every aspect of an OD approach must mirror the desired mission, vision, values and strategic focus, as well as the desired culture, giving people a different experience than the ‘status quo’ that is desired to be changed. What is the ‘message’ given to people in this approach? It seems to me that in their ‘experience’ during the ‘change program’ they are given the same message of that which needs to be changed in the first place – go figure. Duh. And I don’t get such terms that are used such as ‘program’ or ‘initiative’ or whatever in trying to describe what is going on. I say – don’t call it anything… don’t make a big deal about it… just do it. Just give people a different experience – and most of the rest will take care of itself. *Again, a main attribute of the above OD process is the emphasis on creating the necessary degree of readiness, ownership, a shift in ‘mental framework(s), and effective engagement throughout the OD process. The value of such is to ‘make it real’, to reduce the 70% change and development failure rate while at the same time to lower resistance to the changes desired. 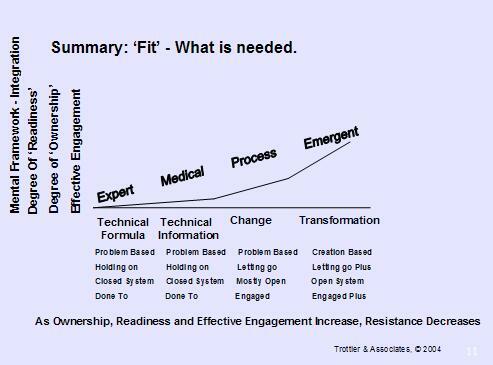 The following ‘FIT’ model illustrates the degree of certain individual and organizational dynamics appropriate to and needed based on the type of change and development desired. I hope this gives you some idea on how I view and approach the practice of fundamental Organizational Development. OD is not ‘change management’ (CM). OD has a distinctive and a very different philosophy, values, fundamentals, perspective, methodology, approach and business value to the client than CM. OD is the continuous, on-going development of an organization as a whole system. CM is a project, an initiative of sorts to move parts of the organization from A to B.
OD is an approach which is distinct. There are many approaches to ‘Leadership Development’. There is an OD approach to ‘Leadership Development’. There are many approaches to Business Process Improvement. There is an OD approach to Business Process development.